The Start Month is used only to track your progress. It’s recommended that you set this to the current month. To set a start month type in the abbreviation or full name for the month and the year. If you’ve been using Tiller for a while, have already made progress paying off your debts, and want to try and see your progress here contact support@tillerhq.com for more details on how to make sure your Debt Progress sheet reflects this. 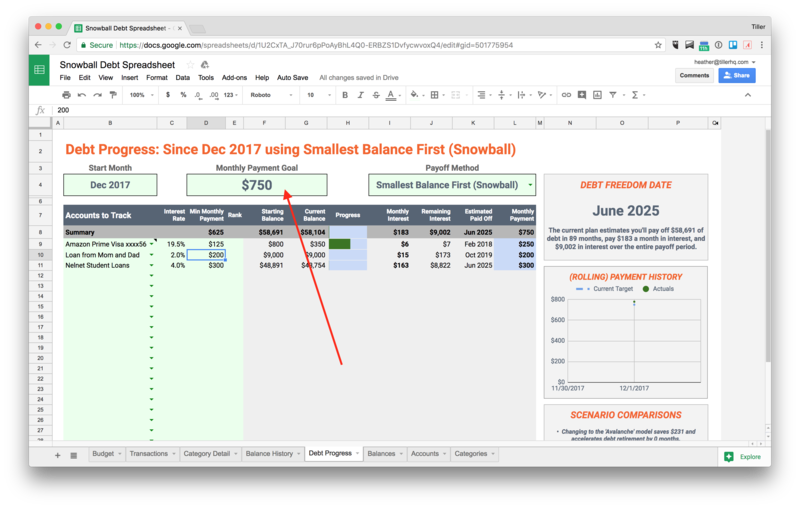 The Debt Progress sheet will give you a suggested Monthly Payment Goal based on your minimum monthly payments and adds an extra 20% to the sum of those payments so that you’ll actually be making progress toward debt payoff. Use this suggestion for now and you can update it later in the setup process. If you already know exactly how much extra you have in your budget to put toward paying off debt you can enter that value into the Monthly Payment Goal and overwrite the suggested amount.